← Friends of SW Charter Committees and Jobs ~ Sign Up Here! It’s time again for student lead parent/teacher conferences. They will take place Wednesday evening October 28th through Friday morning October 30th. 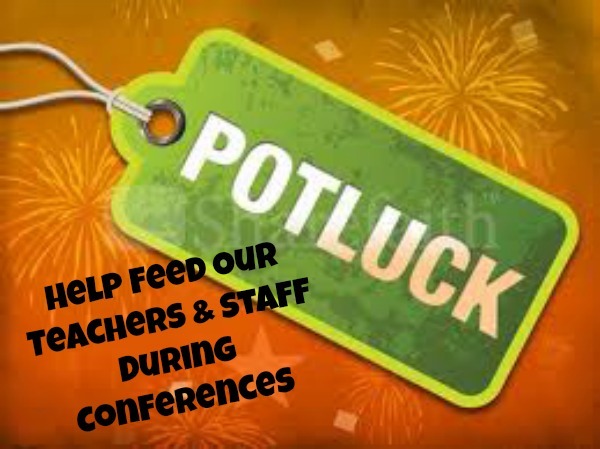 Please log in and sign up below to bring a nut free dish to keep the staff fully energized for the duration of the conferences. We will be serving dinner on Wednesday, breakfast, on Thursday and breakfast on Friday for our staff. This is a great way to give back and let them know how much you care. Breakfast items should be delivered by 8:00 am and dinner delivered by 5:30 pm. The buffet table will be set up in the office. If you need to, you can deliver an item early and store it in the refrigerator in the Griffin Den or in the office. Remember, we need to include some vegetarian, dairy free and gluten free items. This year SW Charter School family-owned restaurant Verde Cocina will be supplying lunch on the 29th. THANK YOU VERDE COCINA!! This entry was posted in Events, Volunteer and tagged conferences, potluck, sign up genius, signupgenius, verde cocina. Bookmark the permalink.